Ronen Birvdaker, a Jewish Indian from Mumbai, was so moved by the 2008 terrorist attack in his home city that he decided to immigrate to Israel last year. On Wednesday, he completed his training to become a soldier in the Israel Defense Forces’ Golani Brigade. Birvdaker, 25, said that after the November 2008 attack — which killed 166 people, including a Chabad emissary and his wife — he felt that as a Jew there was no place for him to live other than in Israel. “I was shocked by the assault on Jews, just because they were Jewish,” he said. “It affected me so much that I felt I had to do something, although at the time, I wasn’t sure what I could do. I thought about it for a while and arrived in Israel last year to serve in the IDF. I was determined to join Golani.” Birvdaker said he was inspired to join Golani after meeting Israelis in Mumbai. 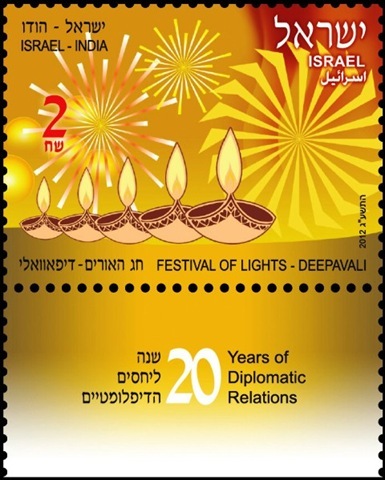 I’m loving the new Israeli and Indian stamps commemorating twenty years of ties. Apparently, the menorah featured on the stamp was inspired by the wooden menorah used by the Jewish community in Bombay. they rushed to safe deposit boxes on their way home. After frantic panning of drains, sewers and monsoon puddles, about 65 were recovered. […] The coordinated bombings, which killed 26 people in the biggest attack against India’s financial capital since late 2008, when a three-day siege killed 166, also staggered the country’s diamond-cutting and polishing industry, the world’s largest. The multibillion-dollar industry still transacts million-dollar deals in rabbit-hutch offices around Opera House, a dilapidated British Raj-era music hall, with brokers haggling over gems on sidewalks below. Diamonds worth a fortune are carried in vest pockets by unarmed, shabby-looking couriers mostly from Gujarat state, north of Mumbai, from families so interwoven that few dare steal anything because the community opprobrium would be so great. 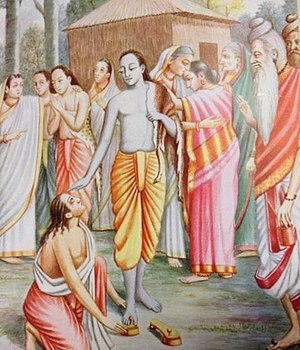 Most academicians at Delhi University are feeling betrayed by their own fraternity, the reason — the Academic Council’s recent decision to drop from the history syllabus a celebrated essay by the late scholar and linguist A. K. Ramanujan on the Ramayana, despite intense opposition from the history department. Outside the Manakula Vinayagar temple in Pondicherry, a former French colony in the Southern Indian state of Tamil Nadu, a temple elephant named Lakshmi collects offerings of rupees with her trunk, blessing devotees and tourists alike with a pat on the head. White curlicues are painted on her face, bells hang around her neck, and silver jewelry adorns her ankles. Behind her, little stalls sell religious knickknacks—faux-sandalwood figurines of Hindu gods and a great profusion of framed pictures. It looks, in other words, like thousands of other temples throughout India, until you examine the pictures more closely. They’re of an old woman with hooded eyes and a cryptic closed-mouth smile who looks a bit like Hannah Arendt. Everyone refers to her as “The Mother,” but she was born Mirra Alfassa. The de facto goddess of this town is a Sephardic Jew from France. Late on Friday night, a Palestinian militant scaled the fence of the settlement of Itamar, south-east of Nablus. He made his way to one of the homes and climbed in through an open window. The first room he encountered was a nursery. He paced in and plunged a knife into a sleeping three-year-old toddler. Still unnoticed, he made his way to an adjacent bedroom, where he found and slayed an 11-year-old boy; then, finally arrived at the master bedroom, where he stabbed and killed the parents along with a four-month-old baby girl. This is not the first time an Indian Prime Minister has extended a “hand of friendship” towards Pakistan, nor is it the first time Dr. Manmohan Singh has done so. Prime Minister Nehru repeatedly offered his hand of friendship and so did his successors Indira and Rajiv Gandhi. IK Gujral hoped the Gujral doctrine would help lessen the trust deficit and Vajpayee undertook a bus yatra to reaffirm that India has accepted the creation of Pakistan and wishes Pakistan well. Dr. Manmohan Singh has repeatedly offered his hand of friendship to Pakistan and expressed the desire to reduce the trust deficit between the two countries. In May 1914 Komagata Maru, a Japanese steam ship carrying 376 Indian migrants, was refused permission to dock at Vancouver in a show of racial exclusionism. On return to Calcutta, a British gunboat met the ship and its passengers, who were considered to be political agitators, and a six-month standoff ensued. Richard L Benkin on Indian students’ attitudes to Israel.